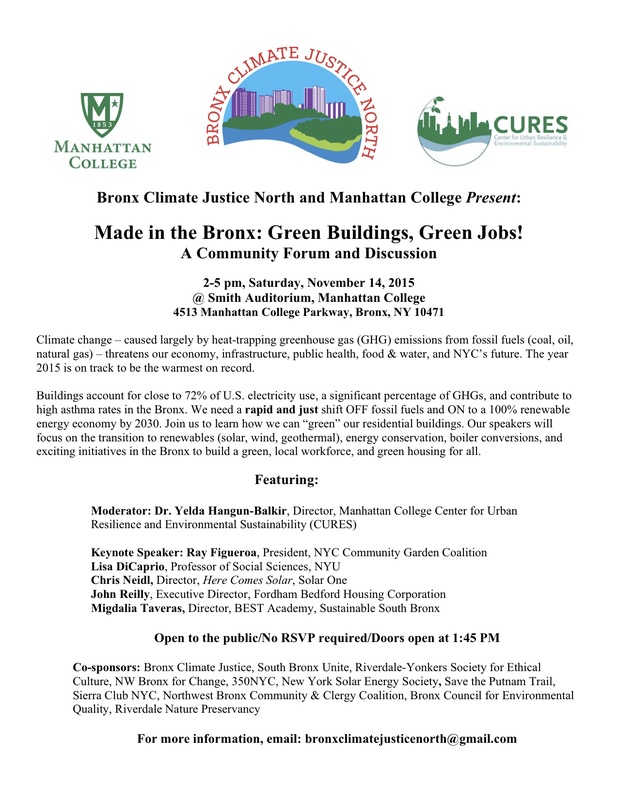 BCJN’s climate justice campaign, “Green Buildings, Green Jobs,” was launched by our Energy Solutions Working Group at BCJN’s first major public event — Made in the Bronx: Green Buildings, Green Jobs. The community forum and discussion took place on Saturday, November 14, 2015 and was co-hosted by the Manhattan College Center for Urban Resilience and Environmental Sustainability. New York City buildings create more than three-quarters of the city’s greenhouse gas emissions (the gases that cause climate change). They pollute our air, causing public health crises like sky-high asthma rates in our borough. And they are “resource hogs” — consuming unconscionable amounts of water, electricity, etc. In his “OneNYC — The Plan for a Strong and Just City” report, Mayor de Blasio has issued a call for greener buildings and for a more just and equitable city. We must hold him to both of these visions. But our city and state are not moving rapidly enough, given the reality that the world is headed for a catastrophic 6-degree Celsius rise in average global temperatures. Governor Cuomo’s call for 50% of the state’s electricity to be met by renewables by 2030 in the 2015 State Energy Master Plan, and New York City’s pledge to reduce greenhouse gas emissions by 80% below 2005 levels by 2050, fall far short of the mark. BCJN, along with 83 environmental, labor, and faith organizations throughout the city and state, as well as 15 legislators in Albany (A 7497/S 527), is a proponent of 100×30 — a bold plan calling for 100% of ALL energy — including heating, cooling, and transportation — to be provided by renewables and by energy conservation and efficiency by 2030. This is a far bolder plan than either NYC or NY State are calling for. But it is achievable and urgent. See Professor Mark Jacobson’s The Solutions Project for detail for achieving 100×30 in NY State. The operations of residential buildings are complex, and residents frequently feel disempowered about tackling efforts to “green” their buildings because they feel they lack sufficient knowledge to begin asking questions. We hope that this questionnaire will put knowledge in people’s hands and help them to build community by getting to know their neighbors as they come together to learn and to make changes in their buildings. The questionnaire and a glossary of terms can be found at our website HERE. 1. Working with Chris Neidl, Director for Solar One’s Here Comes Solar program, to bring this cutting-edge program to the Bronx. 2. Exploring ways that BCJN can promote the work of Sustainable South Bronx and its BEST Academy, SmartRoofs, and Energy Efficiency programs to help create green job growth for Bronx residents. 3. Creating versions (in English and Spanish), of our Sustainable Buildings Questionnaire that are applicable to residents in different types of housing, including NYCHA (NYC Housing Authority) housing. We will be working with NYCHA’s Green Initiatives program. 4. Continuing to reach out to the 20+ Bronx buildings that have not yet complied with the NYC Department of Environmental Protection rule requiring cessation of the use of #6 fuel oil. See NYC Heating Oil regs HERE. BCJN is urging that those buildings that have not yet converted their boilers NOT convert to natural gas. Please go HERE for more information about boiler conversions and the importance of switching to lighter forms of oil and environmentally-sound biodiesel, rather than to gas. 10452 1155 Gerard Ave. 10463 3900 Bailey Ave.
10452 1075 Grand Concourse 10463 3725 Blackstone Ave.
10453 2249 Morris Ave. 10463 99 Marble Hill Ave.
10453 10 West 182 St. 10463 679 West 239 St.
10453 65 East 175 St. 10466 680 East 224 St.
10456 1133 Boston Road 10466 855 East 233 St.
10457 2050 Anthony Ave. 10467 2385 Barker Ave.
10458 2771 Bainbridge Ave. 10467 3530 Bainbridge Ave.
10461 2512 Tratman Ave. 10468 2270 M.L.King Blvd. Bronx County has some of the highest rates of asthma in the United States. Rates of death from asthma in the Bronx are about three times higher than the national average. Just 1% of all buildings in the city produce 86% of the total soot pollution from buildings, more than all the cars and trucks in NYC combined. They do this by burning the dirtiest grades of heating oil, which discharge soot pollution into the air. This soot causes asthma, emphysema, and leads to premature death. The City of New York Department of Environmental Protection has mandated that all buildings cease burning highly polluting #6 oil, which causes high asthma rates and other health issues. Unfortunately, as can be seen in the table above, 22 Bronx residential buildings continue to burn #6 oil. Buildings are now required by NYC to convert to natural gas or to lighter, less polluting forms of heating oil, environmentally sound forms of biodiesel, or steam. Bronx Climate Justice North urges that buildings NOT convert to natural gas, a fossil fuel whose use involves high releases of methane, a global warming gas 86 times more dangerous to the climate than CO2. In addition, converting boilers to lighter forms of oil does not require changes in infrastructure, whereas conversion to gas requires an enormous build-out of new infrastructure that will lock in fossil fuel use at a time when we need to change to renewable energies. John Reilly — Executive Director, Fordham Bedford Housing Corp.